The application interface is user-friendly and provides quick access to all the important functions. All the features of Dictation Pro can be accessed from the Menu Bar. The Toolbar displays the most often-used features. Allows you to open multiple documents, simultaneously. 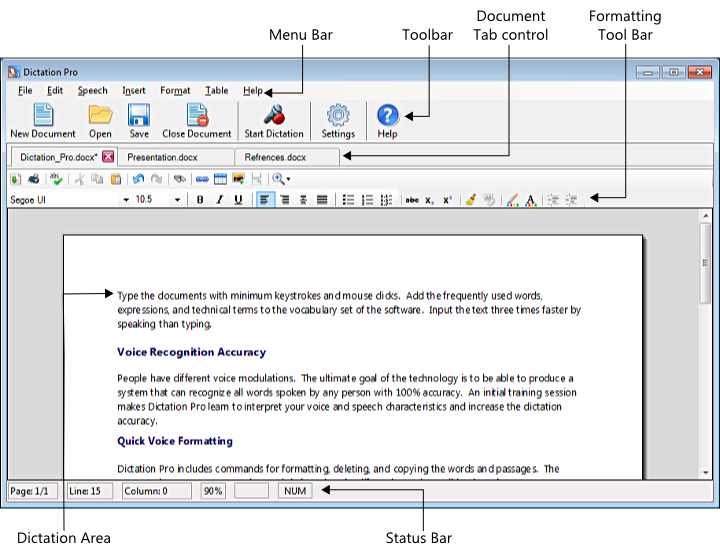 To move between the documents, select the corresponding tab. The most used formatting options are available for quick selection. As you dictate, your text will appear in this area. The Status Bar displays the information about the cursor's position within the document such as page and line number and zoom factor. It also indicates whether the Caps and Num Lock keys are turned ON or OFF.